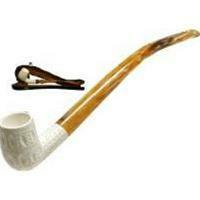 "Churchwarden" is a term used to describe tobacco pipes with long stems. Some Churchwarden pipes can be as long as 16 inches (40cm). They range from being straight to curved like a saxophone. Churchwarden pipes are most well known for their similar appearance to the pipes used in the books and films The Lord of the Rings. Such pipes were very popular as an Oriental influence from the 17th century onwards in Europe. They remained most popular in Eastern Europe, as an emblem of the "Hussars", cavalry troops with roots in the Austro-Hungarian Empire, who went from Russia to France & England during the Napoleonic Wars and brought the pipes with them. It was even known as the "Hussar pipe" at the time. Historical engravings are full of men who loved having their portraits made while enjoying such a smoking instrument. This long stem pipe type has its origins in the Ottoman Empire, geographically and historically. Churchwarden pipes generally produce a cooler smoke due to the distance smoke must travel from the bowl to the mouthpiece. They have the added benefit of keeping the users face further away from the heat and smoke produced by combustion in the bowl. They are also more prone to breakage, though, since more pressure is placed on the tenon when the pipe is supported around the mouthpiece. We plan to stock this section up shortly so please bear with us or visit one of our other fully-stocked pages for all your smoking needs!